An amazing story of faith in adversity. If Nick’s story doesn’t convince us about God’s love & His power & what faith can do, then nothing else will. My name is Nick Vujicic and I give God the Glory for how He has used my testimony to touch thousands of hearts around the world! ผมชื่อ นิค วูจิซิค และผมขอมอบสิ่งดีต่าง ๆ ให้เป็นของพระเจ้าสำหรับโอกาสการเป็นพยานของผมที่จับต้องหัวใจของคนนับแสนทั่วโลก! I was born without limbs and doctors have no medical explanation for this birth “defect”. As you can imagine, I was faced with many challenges and obstacles. ….To count our hurt, pain and struggle as nothing but pure joy? As my parents were Christians, and my Dad even a Pastor of our church, they knew that verse very well. However, on the morning of the 4th of December 1982 in Melbourne (Australia), the last two words on the minds of my parents was “Praise God!”. Their firstborn son had been born without limbs! There were no warnings or time to prepare themselves for it. The doctors we shocked and had no answers at all! There is still no medical reason why this had happened and Nick now has a Brother and Sister who were born just like any other baby. The whole church mourned over my birth and my parents were absolutely devastated. Everyone asked, “if God is a God of Love, then why would God let something this bad happen to not just anyone, but dedicated Christians?” My Dad thought I wouldn’t survive for very long, but tests proved that I was a healthy baby boy just with a few limbs missing. Understandably, my parents had strong concern and evident fears of what kind of life I’d be able to lead. God provided them strength, wisdom and courage through those early years and soon after that I was old enough to go to school. The law in Australia didn’t allow me to be integrated into a main-stream school because of my physical disability. God did miracles and gave my Mom the strength to fight for the law to be changed. I was one of the first disabled students to be integrated into a main-stream school. I liked going to school, and just try to live life like everyone else, but it was in my early years of school where I encountered uncomfortable times of feeling rejected, weird and bullied because of my physical difference. It was very hard for me to get used to, but with the support of my parents, I started to develop attitudes and values which helped me overcome these challenging times. I knew that I was different but on the inside I was just like everyone else. There were many times when I felt so low that I wouldn’t go to school just so I didn’t have to face all the negative attention. I was encouraged by my parents to ignore them and to try start making friends by just talking with some kids. Soon the students realized that I was just like them, and starting there God kept on blessing me with new friends. Posted on มิถุนายน 8, 2009 by Geranun®. 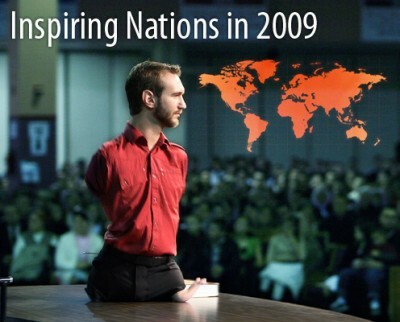 This entry was posted in คมความคิด, เก็บไว้สอนลูก and tagged Nick Vujicic, กำลังใจ, ข้อคิด. Bookmark the permalink.